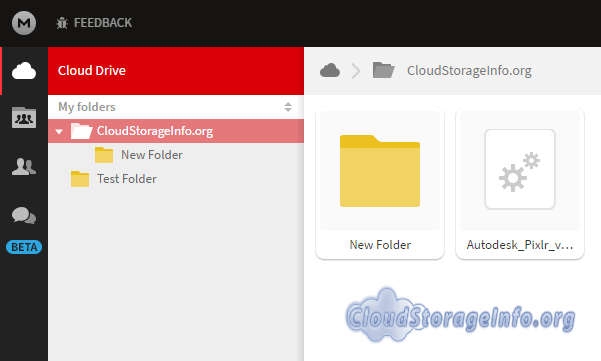 MEGA Cloud Storage Review: The service offers an excellent 15 GB free program for its users. If you wish to get more, you'll have to upgrade. Their plans are a bit unique since they come with a bandwidth limit. Apart from that, they have a very modern and responsive client. Download and upload speeds are slow at peak hours, and the sync&sharing feature is decent with some negative aspects. They also offer browser extensions and a very well made mobile app for iOS, Android, BlackBerry and Windows Phone. Online support is limited to e-mails and poor FAQ base. Overall a viable pick, but there are better options out there. Find the best cloud storage by clicking here. 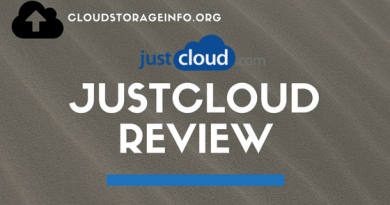 Read the full MEGA cloud storage review down below. You can create a free account that comes with a very generous 15 GB storage limit. I have to say that MEGA is something special regarding their plans. It records how much data you transfer through your cloud. Once you reach your cap your down/uploads will be halted, and you are left with two choices, you either wait for your monthly bandwidth to reset, or you upgrade your plan. Regardless of how bad that sounds, in my personal opinion the bandwidth is large enough for even those more demanding users. I mean, unless you're always downloading, uploading and erasing bigger files, you should be okay. If you go yearly, you get two months for free. Dynamic bandwidth limit explanation: Free account has a dynamic bandwidth. Allowance limit is dynamic and depends on the system utilisation. It has a sliding 6-hour window, moving every hour, to calculate the free bandwidth. Bandwidth is counted per IP address, but the free allocation can vary by country, ISP, time of day, etc. Once you exhaust your free accounts allowance, you will have to wait to gain more bandwidth or purchase more transfer volume by upgrading to an upper level. Additional detail: Pro account users get one allocation of bandwidth per billing period so that annual PRO users will get one year’s worth of bandwidth all at once. Once you get over the bandwidth allocation, downloads stop completely instead of throttling the speed down. The server tells you when more bandwidth will be available and then you can try again. There's no limit on how many friends you can refer. MEGA has a modern looking interface. It does what it was meant for, meaning it's user-friendly. It feels very responsive and interactive. You have two options to pick from, the standard list or the larger icons. Both are viable - The list if you have a lot of files or the larger images for better clarity. There is no limit to how big the files when uploading them to the cloud except your storage limit. They also recommend you to use Google Chrome or Firefox as your browser. They have developed extensions for these two browsers. The extensions reduce loading times, improve download performance and strengthen security. More about them under the Additional features. MEGA is no exception to the universal tradition. They've created their desktop application. It's called MEGAsync. If you're not aware of how this works check it here. Like in any other sync application, it allows you to create an imaginary disk to which you can then store your files. This is probably one of the most useful features overall when we're talking about cloud storage. The idea itself, that you just pick and drop your files to your imaginary disk that could potentially have infinite storage capacity, is fantastic. MEGAsync is a bit slow when responding to new changes. When I copied an already existent document to a new location, it wasn't even registered and wasn't shown in the desktop application. I resolved the issue by moving the new item to the rubbish bin and back. Apart from that, it works as it should. The speed of downloads/uploads is apparently unlimited. However, that's not what I have experienced. Download speed varied from 1.3 MB/s to 2.2 MB/s, whereas my maximum download speed reaches 8 MB/s. This is apparently dependent on the speed and state of your computer, software, OS and your ISP provider's package on the network wholesale market - Or so I was told by their support team. However, I have to say that I haven't had any issues of this form when using other cloud storages, my computer is new and up to date. I will leave the judgment to you, but I do believe that they still have some work to do in that area. You have two options through which you can share your data. They both offer additional settings that you can modify as you wish. 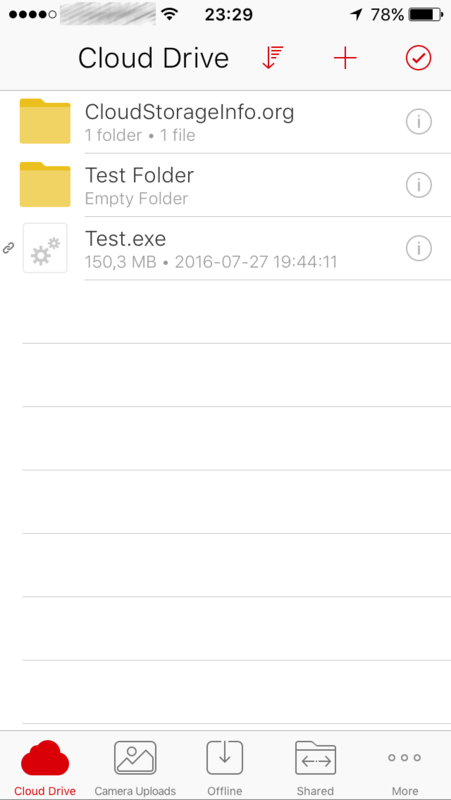 Sharing a link - You can create a link to any folder or file in your storage. There are two different links that you can build - Locked or unlocked. If you wish to keep your data private and share it with only certain people, you send them the closed link with the password included. You can also send a locked link without the password. This is especially suitable when putting the link in public. After that, you just give the password to those that need it. This way of sharing files can be for example seen in universities and colleges. You can also share the unlocked link - Files will be accessible to anyone. MEGA does not offer explicit file versioning. However, you can access overwritten files in the SyncDebris folder, until they are purged. 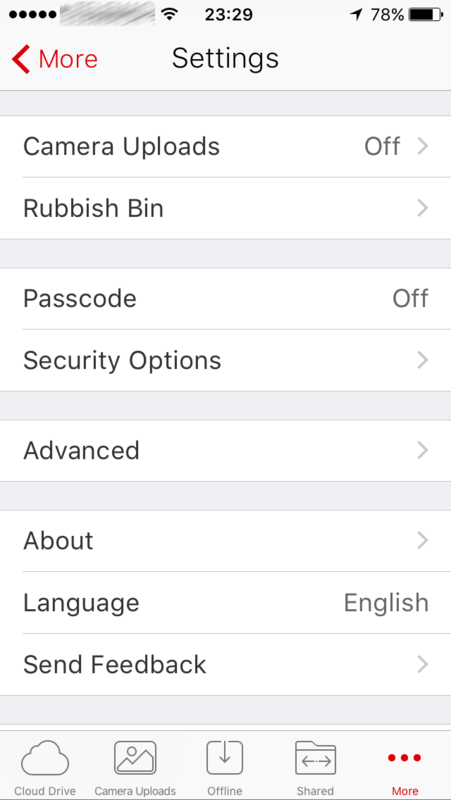 SyncDebris is a subfolder in your rubbish bin that saves overwritten and deleted files. Restoring your data, on the other hand, is rather easy. You just head to your trash bin and transfer them back to your cloud by clicking on the "move" button. Files in your bin keep their folder structure in case you need them again. When moving them back, you can also decide to which folder they should go. Mega is known for its good security protocol. It uses AES encryption to secure files. In addition to that, they use the "Zero-knowledge privacy" which means that they don't keep any of your passwords or master keys, only you have access to them. The only way to recover your lost password is the master key which you receive upon registration. This makes Mega one of the more secure cloud services on the market. Find out more about Zero-knowledge privacy here. This is one of the fields that MEGA could improve on. If you need any help, you can either contact them or go to their support centre. 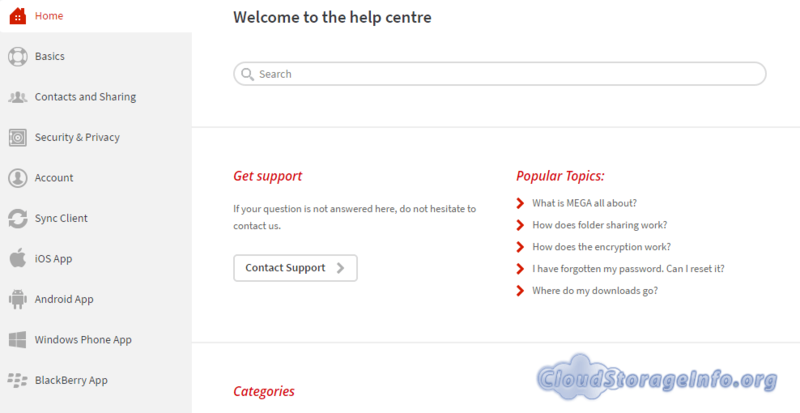 The support centre provides you with basic answers. You head there with one simple question and return with three more unanswered questions. The answers lack additional explanation and are missing some of the crucial facts, which were the reason why you would go there in the first place. If you don't find an answer there, which is likely to happen, you can contact their support through e-mail. While they prioritise the Pro users when answering the email, I still received the responding email when I was trying out MEGA as a free user the next day. They do not offer live chat and you can not call them for any additional questions. "This extension will allow you to install MEGA into your browser. It will reduce loading times, improve download performance and strengthen security" - That's what they say. There are a lot of positive reviews on the Chrome store, but they're related to the cloud storage itself, not the extension. The extension itself doesn't offer anything else than a button on the top through which you can connect to your cloud directly. The loading times are slightly better. The mobile app is available for iOS, Android, BlackBerry and Windows phone systems. The synchronisation is actually really good and the whole app feels very responsive. You also have the ability to upload photos and videos, store your files for offline usage and share them directly from the phone. 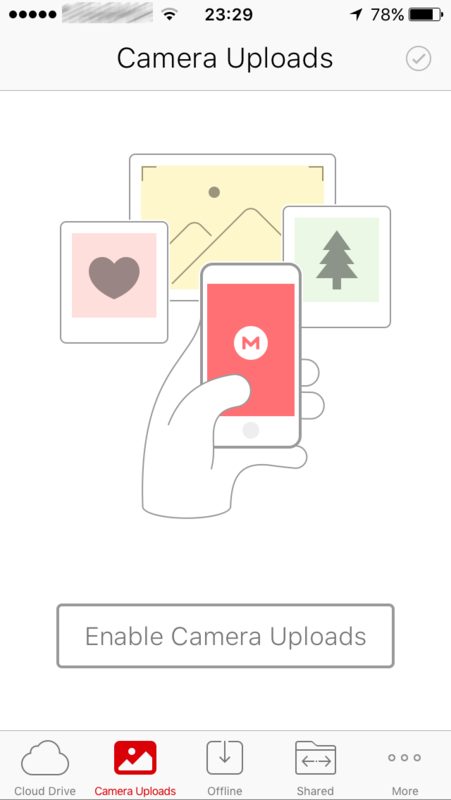 You can also take pictures and save them directly to the cloud. Overall a very decent app. Mega offers some unique pricing & plans, perhaps a bit expensive (Pro I plan) when compared to other cloud storages. The interface is modern and responsive. Download and upload speeds are unlimited but very dependent on your connection to their servers, resulting in slow speeds. The service doesn't offer explicit file versioning and the online support is a bit limited. Mobile application is well made and it feels very responsive. Overall, MEGA is a viable pick, but there are definitely other better options available on the market. 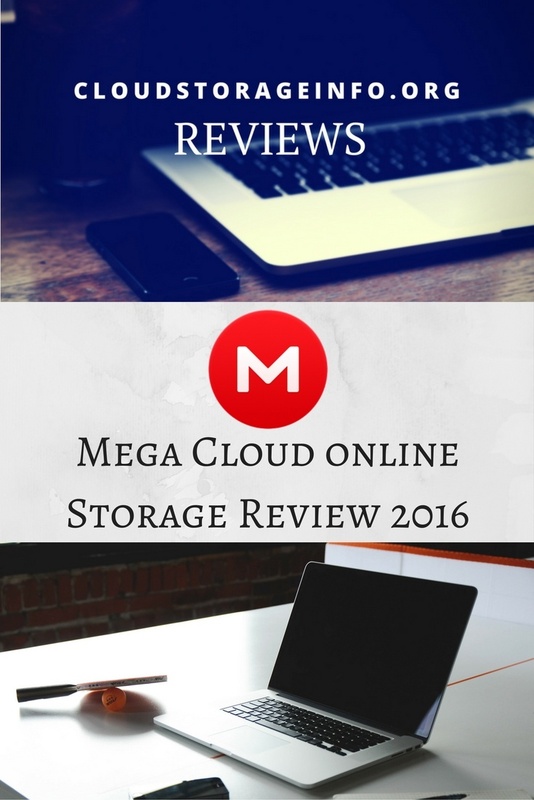 Hopefully, we've gone through all the little things that Mega has to offer within this cloud storage review. YOUR OPINION MATTERS! Review MEGA yourself as well by posting a comment below. Would you just like to share or ask something? Just skip the review part! Lamentably, Mega is not what it once was. In reality you now get 15gb storage, which is nothing special. The “bonus” storage is gained by jumping through their hoops. This might be acceptable if you could keep it… but you can’t because it expires and always reverts to 15gb. If I upload 30gb of files online then I want it to stay there and not have it deleted after a couple of months! I require secure and permanent storage, Not temporary space which expires! Mega was once the leader in secure storage but has now become average (at best) There are now better options if you need storage space which does not expire. What does it mean ”35 GB account registration bonus (30 days). Does it mean that 35 gb is given for 30 days only or is it that you will get 35 gb life long with no expiry date once you register. It means that you will receive 35GB of additional storage for 30 days from the day you register. Well, according to your review, Mega cloud storage seems a good service provider but it’s a little expensive compared to others I’ve used before. I love features pertaining security and privacy and before I consider any cloud storage that’s almost my number one consideration. 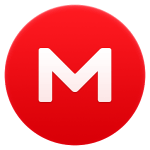 We have been having some cases of the cloud storage broken into by hackers in other servers and I wonder how best preparedness Mega has put this issue in place? Again I value a active support when it comes to programs such as this. Sometimes something isn’t working well, or am not able to get things working and I require instant help, according to your research do you think this is an appropriate program for me? Mega.nz uses the so-called zero-knowledge principle to handle your files which is pretty much all you need in terms of safety & privacy. You’re the only one that can access your files. In terms of support, you can check out their FAQ section or contact them through email. Pro users receive priority but I still received their response the following day. One could wish they would have live support through chat or phone calls but that remains just a wish thus far. In this day and age with computer hacks and malware backing up our computers is very important. Mega sounds like a great option to try. Many of us are not very technical and having all that space is great. The ease of use is great. Hopefully we won’t have to do to much with customer support. Sounds like that is a potential problem area. Do you think that Customer support is needed to often by the average user? Or does everything usually run so smoothly that you don’t need to contact them? In most cases you won’t ever run into the need of contacting the support. It’s simple to use and usually runs without problems. Since 2018 Mega has a different goal. For 3 months 35 GB free or 20 GB free with MegaSync. After 3 months the account can only hold 15 GB! Dejane, imam 17,5 GB na MEGA CLOUD STORAGE ! 15 GB besplatno + 35 GB besplatno kao novi korisnik, za prvih 30 dana ! Kako da shvatim ovaj komentar od exonyme? Dali ce mi obrisati 2,5 GB podataka kada prodju 30 dana? Ja to nisam tako shvatio ! Ja mislim da dobijas 15GB + 35 GB besplatno za prvih 30 dana, sto znaci da je 50GB Upload besplatan u prvih 30 dana nakon registracije ! E sad, ako uploadiras recimo 20 GB, pa prodju 30 dana, za novi 30 GB u FREE paketu ces morati nesto da nadogradis..
Ja sam skoro siguran da ovaj limit znači “storage limit” i ne “upload limit”. Kad prodje 30 dana morat češ da skineš sav storage do 15 GB ako nisi napravio neki upgrade. Dodji nazad pa kaži šta se desi kad dođeš do dana 30. 30 dana privrsava za neki dan.. Pisacu ti sta ce se desiti..
Ali ako je tako kao sto ti mislis, onda ovo nista ne valja.. I would like to say a few words about MEGA. 1. They have the most disrespectful and rude team, who do not give sh*t to customer care and privacy. Registered on site, upload 7GB of the most important data that I had and wanted to keep. Somehow I lost my files in desktop and the password of Mega account as well. Send an email, sent all kind of information that they needed for identification and the GAME started. 2. I had to beg each an every day for a month to give me an access on my data but guess what? 3. They blamed me that I made a mistake and parked an account which is considered as hack. 4. They keep replied the same unhelpful guidance which I could even find myself on the QAF section. Finally, they just replied that they can’t help because of privacy considering. In my life, first time I have seen such a non-senses argue that such big base has no access on guest data and its encrypted. So they just said that they can not do anything. I NEVER EVER recommend you guys to register on that site. They are awful. P.S I am happy that I did not upgrade otherwise I could be more hurt. Thank you for this review. My question is: Why should I need cloud storage? I have always stored everything on my computer and soo far it worked fine but sometimes I wonder if back-up to cloud storage might be a good idea in case something happens to my computer. How do you copy things from your computer to the cloud? Do you have any advice on the easiest way to do that? 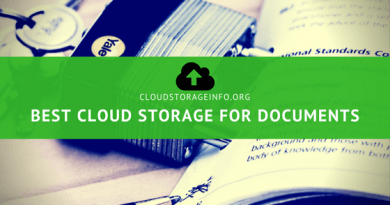 You can find all the advantages of having cloud storage here. In your case I would advise you to get yourself a cloud storage that offers good backup solutions – Crashplan, BackBlaze or iDrive. Copying things from your computer is very simple, it’s just like copying your files into another drive, the only difference is that this one is imaginary and not actually in your computer. I hope I helped you and thanks for stopping by. I am just curious. Maybe I just don’t get it. I have an external drive that I back up pictures and etc on. I also have google cloud and google docs. What is the main purpose that people use a storage like this for? The prices seem reasonable and the I don’t know about the size as I have never really paid attention to it. Are there a lot of other options besides this particular company? Well, essentially all of the services provide some general features. The difference that comes in is what additional features you get and of what quality the whole service is. You should pick your service based on those additional features, prices&plans and the quality of the service overall. I try to expose the pros and cons of every cloud service in order to try and make your decision easier. You can see all the reviews of companies here. Thanks for stopping by. Very nice review of cloud service providers. This is a very important topic because i have experienced first hand how important it is to have your data available when and where you need it. Carrying around flash and external drives is not fun at all also not to mention the number of times that i lost my flash drive or the data got corrupted. I still think that some people are hesitant to use online storage because of privacy issues. People just don’t think their data is safe from prying eyes. It’s only natural for people to be afraid to trust their data to somebody else. But, if you pick the right service provider you shouldn’t be afraid. Thanks for stopping by. Thanks for the review. There are so many choices to choose from in storage it can make your head spin. But do you think it is important to find a credible source to help you with your storage? Or do you think most will do a good job and the only question is the price? I know that backing up your data can be a headache. I let my data on my computer get backed up over the years. Got busy and lost all my data. Before deciding which cloud storage to use, you should definitely check some reviews and learn more about what features they offer. That will make your decision a lot easier. Finding a credible source sure is the right way to go. Not all of them will do great in everything, meaning price is not all there is. Backing up your data is another story. After I am finished with cloud storage reviews I’ll probably take a look at Cloud Backup services as well. Follow me on Google+to stay up to date. Nice review. I’ve used MEGA and there MEGASync desktop app a lot for downloading large important files of the internet. It seems like a pretty nice cloud storage service. How much have you personally used it? I have to say that it’s got to be my favorite one after google drive. I’ve personally been testing the service for a few days to see how it reacts to everything. The results of it are shown in the review. Are you saying that you had no problems with the download/upload speed, meaning they were on your maximum ? It’s definitely a viable choice, have you tried any other cloud storages apart from MEGA and Google Drive ? Great post very useful, we all need more storage to save our information. I might go for the pCloud cloud storage though, the one you recomended. It seems better in every way. I will keep your website for future references and I will share it with others. Nice work! I am glad I was able to help you with your decision Sophie. Let me know if you need anything!